The intention behind Actinolite is straightforward; our focus is food. We explore our landscape and search for ingredients that are at their peak of freshness. We source and promote Canadian products and producers, prioritizing how and where they are grown and raised. We engage our memories, senses and connection with the land in the creation of our food. We care about building community—starting with our team of dedicated employees and extending out to the people that support us. We forge our own path, striving to discover, progress and evolve each day. Actinolite is not just a restaurant. It is a home base, it is a space for experimentation and experience, it is the meeting place for amazing people and fortunate circumstances. 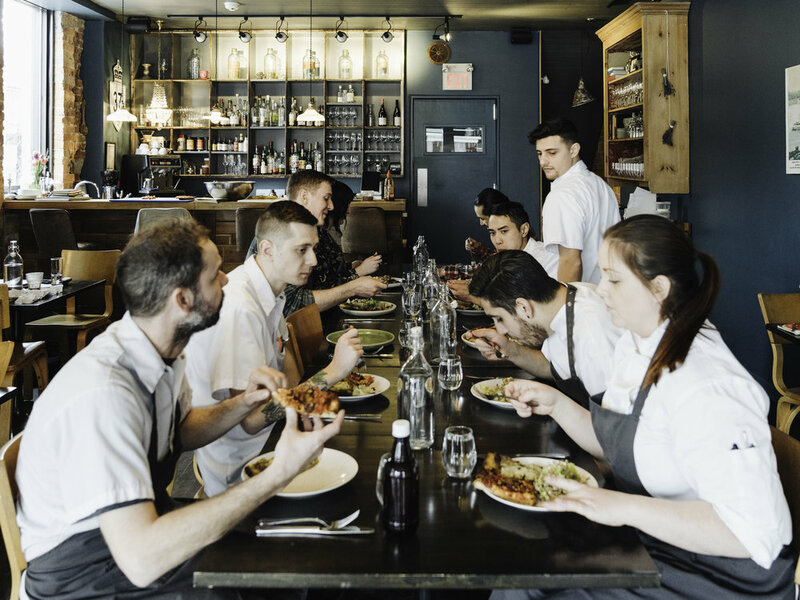 What started out in March 2012 as a little neighbourhood spot with a traditional three-course menu has slowly but surely evolved. The inspiration came from daily trips to farmers’ markets and from growing ingredients in our own garden. We became obsessed with the freshness and quality that came with picking produce and presenting it on the plate moments later. We became fixated on what the land around us had to offer—harvesting the restaurant’s urban garden out back and foraging the fields around the actual town of Actinolite (“Actinolite North” as Chef Justin affectionately calls it). Our Chef’s Menu, which debuted discreetly at first in fine print at the bottom of the standard menu—is the product of this bounty: a seven-course meal built around hyper-fresh ingredients as selected by the kitchen. Word about Chef’s Menu spread and soon the majority of our guests were requesting this memorable meal. This was the crossroads. We decided: in order to give our guests the full experience of Actinolite, we would offer a Chef’s Menu (seven courses) and a Summary Menu (four courses). The cooking is simple, but not simplistic. A lot of hard work, focus and great care goes into creating food with few ingredients. We evolve the menu according to what’s in season, fresh and available, and not just for the sake of change. Our dining experience is a journey, inspired by honest, seasonal food and encouraged by the generous spirit and support of our community.